Zoom out of its cultural heritage, and Sopore has two famed features: an apple town and a freshwater body. The Kashmir pocket in Baramulla district teems with apple orchards that have gifted scenic Sopore with a mandi (market) of the fruit. Plus, there’s the sprawling Wular Lake bordered by willow plantations. Now drill deep into the ethos of the santoor: it has the sweetness of apples and the placidity of the Wular. The two elements find vivid resonance in the playing of the instrument by Bhajan Sopori, who celebrates his 70th birthday today. The classical musician takes pride in being a native of Sopore (originally Suyyapur) believed to be founded in 880 CE during Utpala dynasty’s Avanti Varman’s reign that saw the consecration of several Hindu temples and Buddhist monasteries. Pt Sopori traces his lineage to 17 generations of members in his family who had successively been players of the trapezoid-shaped instrument played by striking the strings tunefully with a spoon-shaped mallet hammer in both hands. Called shatatantri veena in Sanskrit texts, the santoor dates back to ancient times. Some researchers slot it as an improvised version of a primitive instrument played in the Mesopotamian times (1600-900 BC). That prompts Pt Sopori to speak more about his school of music called Sufiyana prevalent in both Kashmir and Jammu regions. “Our gharana comprises two traditions. One is Hindustani classical, and includes both vocal and instrumental (sitar, wasool, dukra, sitar and santoor). The other is the Sufiana music of our Kashmir,” he says, adding that the Sufiana style itself owes it roots to Hinduism’s Shaiv Gayan. Interestingly, Sopori began his Hindustani tryst by playing the sitar, and then branched out to santoor. Besides being an instrumentalist, who also learned Western classical music from Washington University after learning Hindustani from his grandfather S.C. Sopori and father Shamboo Nath, Bhajan is a composer as well. He has tuned hundreds songs in several Indian languages starting from those more familiar to him like Kashmiri, Dogri, Urdu, Hindi and Sanskrit to Pujabi, Himachali, Rajasthani and Bhojpuri to the Telugu and Tamil down south of the country, besides in Persian and Arabic. These vary in genres: ghazal, geet, bhajan, choir, devotional (Hindu, Muslim and Sikh) besides children’s ditties. The works, not to be missed, are also of legendary Sufi saints such as Lalleshwari, Sheikh-ul-Aalam, Amir Khusrau, Kabir, Hafiz Sherazi, Bulle Shah, Ghani Kashmiri and Baba Farid. The master, who gave his first public concert in 1953 at the age of five, has also come out with a few ragas such as Laleshwari, Patwanti and Nirmalkauns. While delineating their essence in long Dhrupad-style alaaps, Padma Shri Sopori also comes up with inventive glides (meends) where the santoor—far from its typical jingles—produces a timbre similar to the dense rudraveena. Pt Sopori’s son Abhay Rustum is an artiste who has already gained name as a santoor player. A winner of prestigious laurels such as the Central Sangeet Natak Akademi’s Ustad Bismillah Khan Yuva Puraskar (2006) and J&K State Award (the state’s highest civilian honour, in 2011), Abhays hails from Srinagar, where his father had by then settled. Like Sopori Senior who has performed in Europe, Africa and the US, Abhay, too, has performed in the East and West of the globe, having also learned Western Classical. In fact, he is the youngest visiting faculty at the University of Massachusetts and has been the only contemporary Indian composer, whose Haftrang, as a tribute to Kashmir, has been conducted by maestro Zubin Mehta. That honour was “surreal”, also given that Kashmiri music went on to meet western orchestra, gushes Abhay (who debuted in Delhi at age 10) in a talk with a leading national daily three years ago. Music lovers keep experiencing great joy in seeing the father-son duo perform jugalbandi. 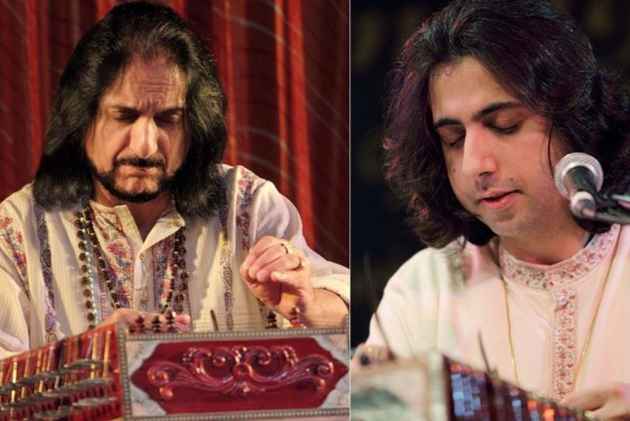 Viewed from a socio-religious angle, the Soporis’ tranquil-centric Sufiana style of playing Hindustani classical on the santoor has greater relevance in the present times when the Kashmir Valley has been riddled by a civil strife that is more than a quarter century old. As septuagenarian Bhajan himself notes, “My forefathers were mystic masters and bearers of a rich legacy that I am trying to carry forward.” In that Abhay, too, has his role.